With departures from Bere Island and Castletownbere, it has become a firm favourite with visitors and locals alike. We will bring you on an exciting, fun filled sea tour of the Bantry Bay area whilst also showing you spectacular sights and attractions. Climb aboard one of our specially designed RIBs and experience a thrill like no other. We regularly visit sights such as lighthouses, caves, cliffs and beaches, with the possibility of seeing a wide variety of birds and wildlife. Watch out also for dolphins, puffins, kittiwakes, porpoises, seals and much more. We will show you the spectacular coastline of Beara which is in complete contrast to the view from the shore, gone are the houses, the road signs, the traffic. Instead, there are empty beaches, snug harbours caves and great expanses of fields and cliffs – the real visual delight of Ireland and of course the wildlife. 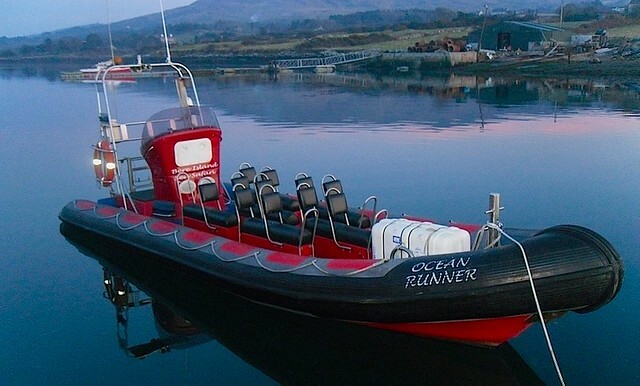 The duration of the regular trip is 1 hour, but a group charter can be arranged for a longer duration for a visit to any destination in Bantry Bay, a great idea for a family/corporate/work/school outing, please call and we can arrange a charter to suit your requirements.